The National Stamp Advisory Committee is willing to consider a Lyme Awareness Stamp if enough national interest is received. You can help with the (updated) letter templates and options provided here, or via groups noted in this post. In November 2014, the leader of a support group called Lyme Disease Eugene Oregon, Deb (‘Dive GirlDeb’ on Facebook), suggested that a U.S. postage stamp would be an effective awareness tool, and further suggested that people write to The Citizens Stamp Advisory Committee in support of the idea. The idea spread quickly and was supported by patients and facebook groups, leading to contact with the Stamp Advisory Committee, letter templates and ideas, and hundreds of letters written by the end of the year. Still, it will take continued support (via letters to the Committee) to show the national interest the committee is looking for. If you support the idea, you can a) read further, b) use the information below to write a letter, c) use the template below to write a letter, or d) print the form letter version out, fill in your information, and send. Option d can also be used to print copies to give to friends, loved ones, and acquaintances to make it easy for them to show support as well. Within the first month, Lyme patients nation-wide had begun sending letters and asking friends and family to do the same, in order to meet the goal of having letters sent from all states. 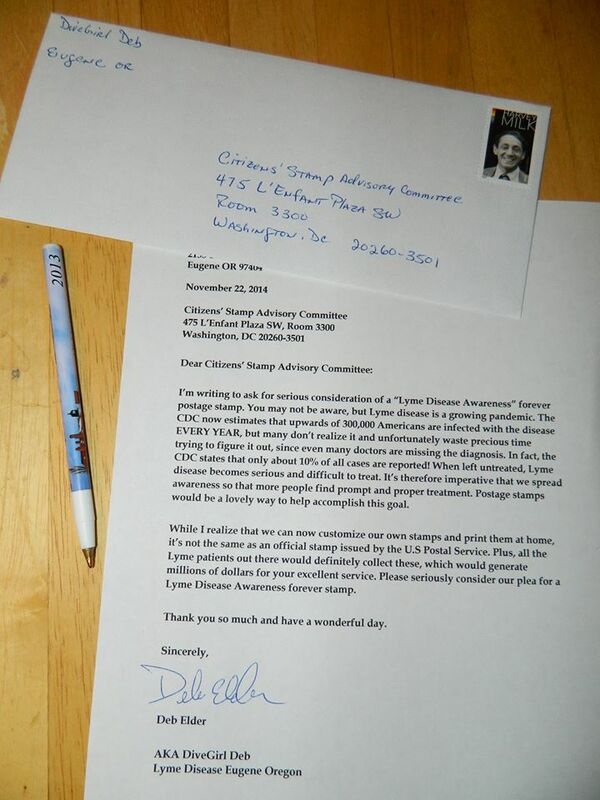 Lyme patient Bambi Albert, of Pennsylvania, even had her post master send in a letter (which is a fantastic idea). 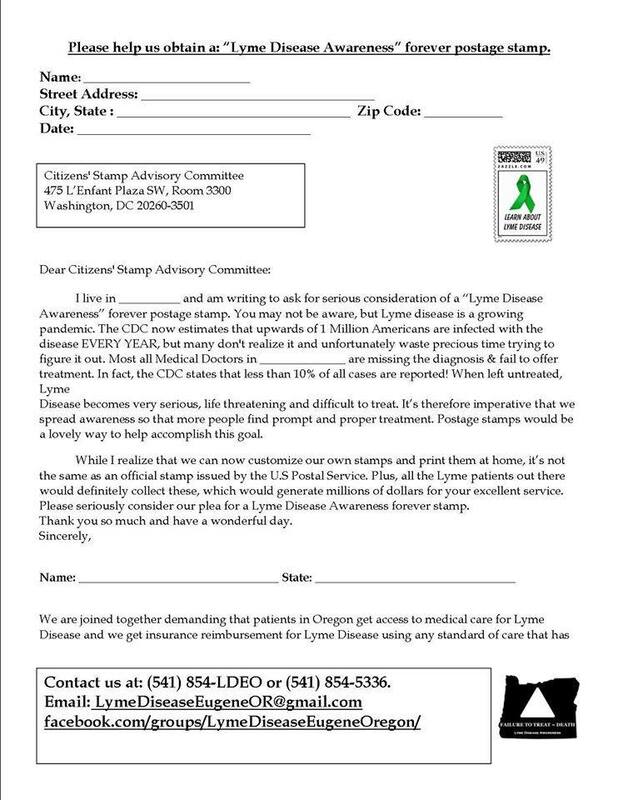 In November, the idea spread to additional groups, and Sheila (‘Sheila Bush No Relation’ on Facebook), the founder of the 1,000 Letters Lyme Campaign, helped generate interest in this idea as well, and created a template letter (included below) for interested folks to use, or to help folks get started, if desired. *Further information on the 1,000 Letters campaign, for those not on Facebook, can be found in the top and top right tabs on this blog’s home page. Deb’s letter, ready to go. Lyme patients have begun sending letters to the committee and have begun receiving responses that include information regarding what would be needed for this to happen—a primary factor being national interest. Please read the re-posted-with-permission Facebook thoughts and requests, below. Visit either group on Facebook for more information, or post in the comments section below for further contact info, feedback, questions, or to tell us you’ve mailed a letter. Visit both groups on Facebook and check resource tabs here for additional on-going Lyme awareness campaigns and needs. WE MAY BE GETTING AN OFFICIAL LYME DISEASE AWARENESS POSTAGE STAMP! Dive GirlDeb had the idea that we should all write to the post office to request a “Lyme Disease Awareness” forever stamp. Some of us did so and now FOUR PEOPLE HAVE RECEIVED RESPONSES! The committee is going to discuss it and said that NATIONAL INTEREST PLAYS A ROLE IN THEIR DECISION. So, please, let’s EVERYONE mail them a letter. Ask your friends and family members to do so too. We’ve already written the letter for you–all you have to do is print it and mail it. Can you imagine if we can make this happen! It would be HUGE and GREAT! We need every American in the country to know that Lyme disease is at epidemic proportions and spreading. Let’s make this stamp happen! PLEASE SHARE! So far we know of 30 people who have mailed the post office. We need more. If we can get a U.S. postage stamp for Lyme disease, it will be HUGE and amazing! Here is the address and here’s a letter you can use (or you can write your own)….We’re trying to find at least 500 people to write. Thanks! 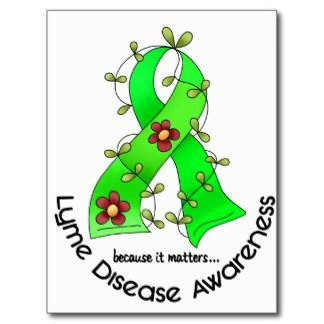 I’m writing to ask for serious consideration of a “Lyme Disease Awareness” forever postage stamp. You may not be aware, but Lyme disease is a growing pandemic. The CDC now estimates that upwards of 300,000 Americans are infected with the disease EVERY YEAR, but many don’t realize it and unfortunately waste precious time trying to figure it out, since even many doctors are missing the diagnosis. In fact, the CDC states that only about 10% of all cases are reported! When left untreated, Lyme disease becomes serious and difficult to treat. It’s therefore imperative that we spread awareness so that more people find prompt and proper treatment. Postage stamps would be a lovely way to help accomplish this goal. While I realize that we can now customize our own stamps and print them at home, it’s not the same as an official stamp issued by the U.S Postal Service. Plus, all the Lyme patients out there would definitely collect these, which would generate millions of dollars for your excellent service. Please seriously consider our plea for a Lyme Disease Awareness forever stamp. *Post updated Feb.13, 2015, to include form letter and slightly updated background.